mediaobject — A displayed media object (video, audio, image, etc.). This element contains a set of alternative “media objects.” Exactly one object will be selected and rendered. Formatted as a displayed block. The primary purpose of the mediaobject is to provide a wrapper around a set of alternative presentations of the same information. If possible, the processing system should use the content of the first object within the mediaobject. If the first object cannot be used, the remaining objects should be considered in the order that they occur. A processor should use the first object that it can, although it is free to choose any of the remaining objects if the primary one cannot be used. Under no circumstances should more than one object in a mediaobject be used or presented at the same time. For example, a mediaobject might contain a video, a high-resolution image, a low-resolution image, a long text description, and a short text description. In a “high-end” online system, the video is used. For print publishing, the high-resolution image is used. For other online systems, either the high- or the low-resolution image is used, possibly including the short text description as the online alternative. In a text-only environment, either the long or the short text description is used. Starting in DocBook V5.1, there can be more than one data element inside the videoobject, audioobject, or imageobject. When more than one data element is present, they should all be rendered. The expected semantics are that the down stream processor (for example, a web browser) will select the appropriate alternative. These elements contain mediaobject: acknowledgements, annotation, answer, appendix, article, bibliodiv, biblioentry, bibliography, bibliolist, bibliomixed, bibliomset, biblioset, blockquote, callout, calloutlist, caption (db.caption), caution, chapter, colophon, constraintdef, cover, dedication, entry, equation, example, figure, footnote, glossary, glossdef, glossdiv, glosslist, important, index, indexdiv, info (db.info), info (db.titleforbidden.info), info (db.titleonly.info), info (db.titleonlyreq.info), info (db.titlereq.info), informalequation, informalexample, informalfigure, informaltable (db.cals.informaltable), itemizedlist, legalnotice, listitem, merge, msgexplan, msgtext, note, orderedlist, para, partintro, preface, procedure, qandadiv, qandaset, question, refsect1, refsect2, refsect3, refsection, refsynopsisdiv, result, revdescription, screenshot, sect1, sect2, sect3, sect4, sect5, section, setindex, sidebar, simplesect, step, table (db.cals.table), taskprerequisites, taskrelated, tasksummary, td, textobject, th, tip, toc, tocdiv, topic, variablelist, warning. The following elements occur in mediaobject: alt, audioobject, caption (db.caption), imageobject, imageobjectco, info (db.titleforbidden.info), textobject, videoobject. 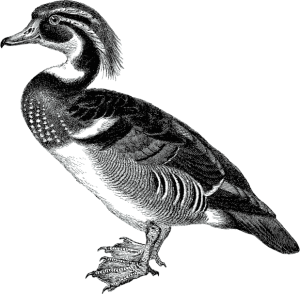 The bird on the cover of DocBook: The Definitive Guide is a wood duck. Often considered one of the most beautiful ducks in North America, the male wood duck has a metallic purple and green head with white streaks extending from its bill around the eyes and down to its blue and green, gold-flecked wings. It has a white neck, chestnut-colored chest, a white or red bill, and yellow-orange legs and feet. Females have more brown, gray, and subdueed hues.